Most climate science researchers, from alarmists to skeptics, agree that the world has warmed since the end of the Little Ice Age (LIA). This global LIA-rebound warming trend has also affected the U.S. continental climate. Many experts believe that this built-in warming trend from the Little Ice Age continues, just as the post-glacial rebound due to the melting of ice sheets continues even to this day, thousands of years after the ice sheets completely disappeared. Although there are currently no means for scientists to determine if modern warming (since 1950) is actually more a result of the continuing LIA-rebound, or of natural climate fluctuations, or due to solar/cosmic gyrations or a result of a wide variety of human influences, one can still compare the earlier warming period amount, pre-1950, to that of the modern warming. In fact, U.S. continental temperature records go back to 1895, which provides interesting evidence about U.S. climate warming. To accomplish this comparative analysis, NOAA’s monthly temperature dataset will be utilized to construct 5-year temperature averages (60-month moving averages). We know from NOAA’s climate records that the earlier U.S. warming topped out in December 1935 – specifically, that’s when the 5-year average temperature hit its peak. The records for 5-year averages only go back to December 1899, thus the LIA-rebound warming dataset spans 422 months for this comparison. Likewise, the NOAA dataset finds that the modern peak of 5-year average temperatures to have taken place during January 2002. By going all the way back to November 1967, a second 422-month temperature record is produced that happens to encompass the modern era’s large influx of consumer/industrial CO2 emissions (i.e., greenhouse gas). So, we have two NOAA 5-year average temperature datasets, each spanning 422 months, with one including the temperature peak prior to the huge, modern CO2 emissions; the other being a period that represents the modern warming that has been so feared, which peaked in 2002. How do these two periods compare, in terms of actual warming? Well, to make the comparison an apple-to-apple comparison that is easier to visually discern, the two 5-year temperature datasets have been made to start at the exact same temperature anomaly. Now examine the above temperature plots on the left (click on left chart to enlarge). Do you see the obvious conclusion? After 422-months, the total modern warming greater than the pre-1950 warming period amounts to a miniscule fraction of a degree – about twelve one-hundredths of a degree (F). Those Stubborn Climate Facts: after 35+ years, this tiny difference between the two periods is entirely within the range of natural climate variation that one could expect. Yes, the temperature plots on the left reveal both differences and similarities in the overall warming pattern, but in the end, they almost finish in a dead heat (pun intended) regarding the amount of warming over 422 months. This actual NOAA empirical evidence is why the vast majority of climate scientists do not agree with the supposition that humans have caused all the modern warming. Clearly, most experts recognize that a very significant percentage of warming for the modern era is likely no different than the earlier period’s. Moving onto the next comparison, how do the representative temperature changes compare after these two peaks took place? The plots on the right reveal that information. From January 2003 to April 2014 represents 136 months, after the peak in 2002. In a similar fashion, the 136-month period after the 1935 peak ends in May 1946. The chart on the right (click to enlarge) are for both these periods, and again, these two datasets are adjusted to begin at the same temperature anomaly in order to ease visual comparison. How do these two ‘post-peak’ periods compare? Simply put, both the pre-1950 and modern ‘post-peak’ period exhibit a sustained cooling trend, based on the 5-year average temperatures. The cooling patterns exhibited by both are similar in their yo-yo, up and down movements, with variation though. And the cooling amount outcomes for both trends are within three-tenths of a degree (as recently as the 110-month mark - February 2012/March 1944 - the two periods essentially match). Regardless of reason (i.e. climate attribution), recent global warming has not produced a “dangerous” 5-year warming span that is significantly different than past periods “dangerous” warming in the U.S. The fact of Earth’s current extended “global warming” pause is a strong indication that points 1 and 2 above hold sway as the driving forces, not #3. Finally, the NOAA climate records are not kind to the CAGW claims, which has had predictable results by its proponents as they lose the scientific debate. As a result, climate-doomsday scientists are now resorting to some very ugly, anti-scientific tactics. 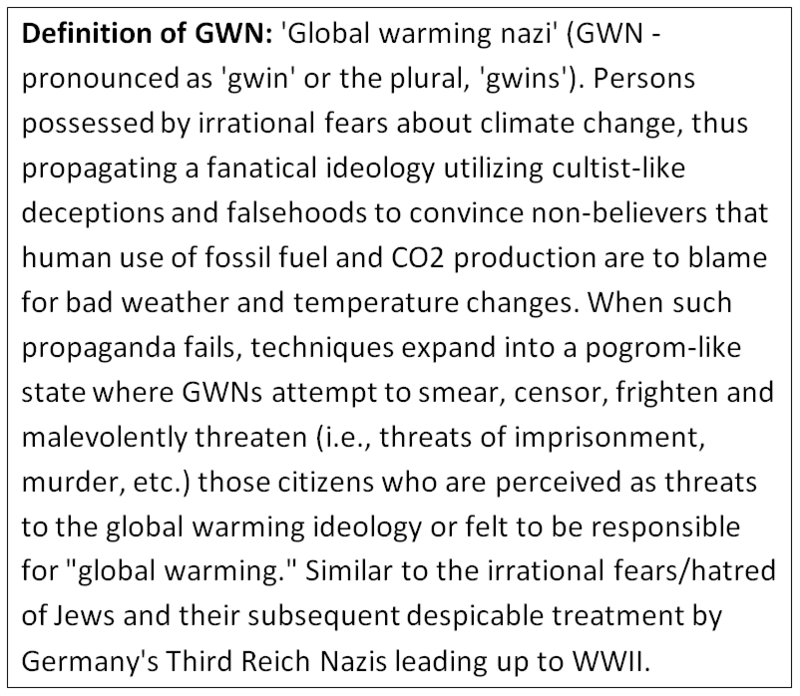 This past week of alarmism tactics just witnessed a new round of climate science ugliness (read here and here) that harkens back to the totalitarian/authoritarian regime tactics under Hitler, Stalin and Mao. Both articles list names of the usual GWN suspects who perpetuate this ugly form of climate "science." Note: NOAA U.S. temperature dataset and Excel used to produce graphs and 5-year averages; or download original data from this site. Hey, don't know how to chart in Excel? It's easy to produce charts - you can do it too!. Go here to learn how.